Renault has revealed the pricing and specification for the Clio Renaultsport 220 Trophy. The 220 Trophy, which will make its UK debut at the Goodwood Festival of Speed from June 25-28, will deliver 220hp for £21,780 and is aimed at track-day enthusiasts and drivers who demand cutting-edge performance, handling, style and equipment for road use. Order books are open now, with first UK deliveries expected in August. At the same time there have been revisions to the Clio Renaultsport 200 models, with the introduction of EU6-compliant engines featuring Stop&Start. The Clio Renaultsport 220 Trophy is a numbered special edition model that sits at the top of the Clio Renaultsport range. It features a larger turbocharger and revised mapping compared with the 200 models, boosting the outputs of the 1.6-litre direct-injection turbo engine by 20hp (10 per cent) and 20Nm (8.5 per cent) to 220hp and 260Nm, with a further 20Nm available through the ‘Torque Boost’ feature in fourth and fifth gears. There is also a revised air intake and exhaust system to minimise back-pressure losses. The rev limit has been raised to 6,800rpm as opposed to 6,500rpm in the 200 versions, with peak power arriving at 6,050rpm. Maximum torque is available at only 2,000rpm. Boost pressure has been increased from 0.96 bar to 1.03 bar. This all translates into a 0-62mph time of 6.6 seconds on the way to a top speed of 146mph. This more potent and higher-revving version of the Clio Renaultsport power unit is fully EU6-compliant and features Stop&Start, helping towards fuel economy and emissions – achieving 47.9mpg on the official NEDC combined cycle and 135g/km. A further contributor to this is the standard Efficient Dual Clutch (EDC) gearbox, which, for the 220 Trophy, has been substantially recalibrated by the performance experts at Renaultsport. It now delivers up to 50 per cent faster shifts and permits greater flexibility in Sport mode for more comfortable driving in built-up areas. The steering wheel-mounted paddles have been revised with 30 per cent shorter travel in order to provide a more immediate and responsive feeling. The higher rev limit along with new software calibration allows earlier down changes under heavy braking during track use. 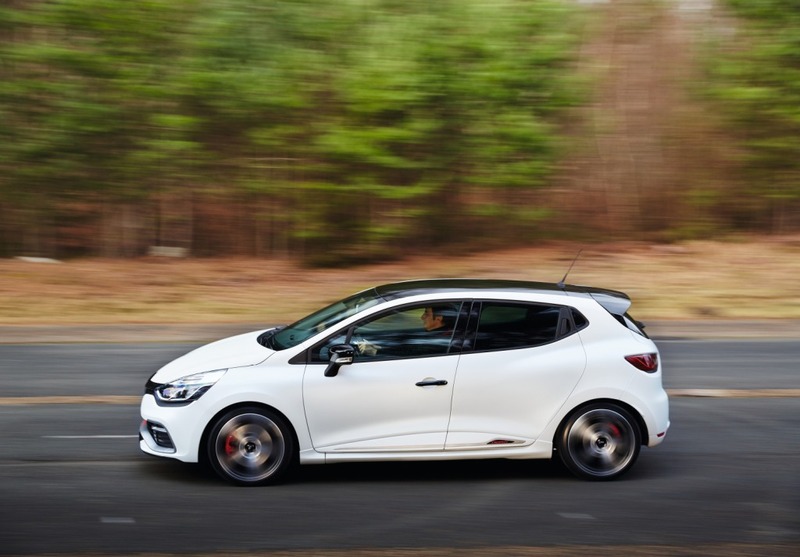 The Clio Renaultsport 220 Trophy is fitted with the R.S. Drive system with Normal, Sport and Race settings. Stop&Start is deactivated in Sport and Race modes. R.S. Drive permits multiple downshifts when the appropriate paddle is continuously held and also features Launch Control. In Race mode, the gearchange is a manual-only operation; it will not kickdown or change up at the rev limiter without intervention by the driver. 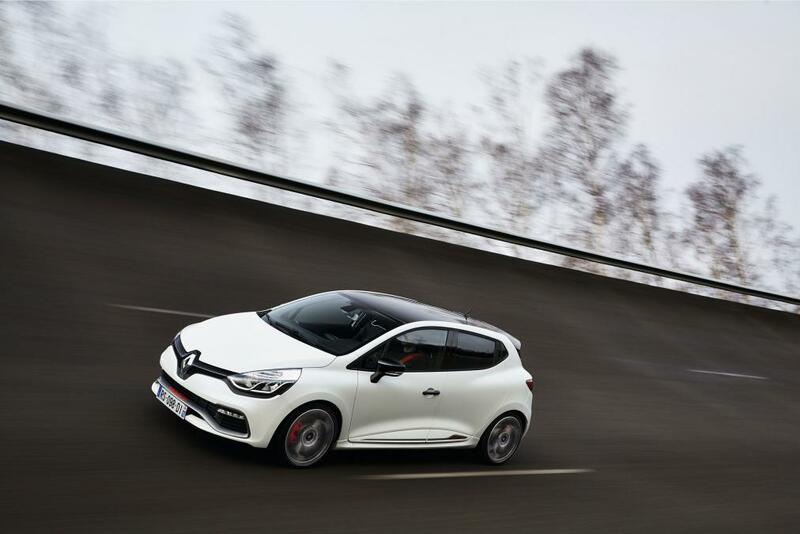 The 220 Trophy has firmer and lower suspension and faster steering than other Clio models. The Trophy setting is lowered by 20mm at the front and 10mm at the rear. To put that into perspective, the Cup chassis on the regular Clio Renaultsport is only 3mm lower than the standard set-up. The dampers of the 220 Trophy are firmer and there are 40 per cent stiffer rear springs coupled to motorsport-derived hydraulic bump stops – a feature carried over from the regular 200. The car also has the R.S. Diff to maintain traction in difficult conditions or extreme high-performance track use. Renault say the steering is incredibly direct thanks to a 10 percent reduction in the rack ratio from 14.5:1 to 13.2:1. Renaultsport engineers are even going as far to claiming it is best steering system on the market. Finally, the 220 Trophy is fitted with high-performance Michelin Pilot Super Sport 205/40R18 tyres on 18-inch ‘Radical’ wheels with black inserts and diamond-effect facings. The 220 Trophy is available with exclusive Frost White paintwork, a new and distinctive Renault i.d. matt body colour. This colour also comes with a gloss black roof and rear spoiler for £1,300. Glacier White, Deep Black, Flame Red and Liquid Yellow are also available. The flagship of the Clio high-performance range also comes with ‘Trophy’ badging on the front blade, door mouldings and individually-numbered door sills. Standard interior highlights unique to the 220 Trophy include an embossed leather steering wheel and carbon-look air-vent surrounds, door handles and gearlever base plate. The air-vent inserts are in satin chrome. Heated leather ‘Trophy’ sports seats with integrated headrests are available as a £1,600 option. The latest Renaultsport Monitor V2 sophisticated on-board telemetry system, which includes a setting that gives the driver five different levels of throttle pedal sensitivity, is a £295 option. Other standard features include the Renault R-Link system featuring a connected multimedia tablet, 7-inch touch-screen, voice control, TomTom LIVE satellite navigation, a DAB radio with 2 x 35W speakers, Bluetooth music streaming and hands-free telephone operation, 3D sound by Arkamys, vehicle and web connections, USB and AUX sockets and a rear parking camera with sensors. A hands-free keycard with automatic door locking, engine start/stop button, automatic climate control, automatic lights and wipers, cruise control, speed limiter, front and rear electric windows, electrically adjustable and heated folding door mirrors and a height-adjustable driver’s seat are also standard. The two Clio Renaultsport 200 models – the 200 and 200 Lux – sit alongside the 220 Trophy in the line-up, but with increased torque, lower fuel consumption and reduced CO2 emissions as a result of the introduction of an EU6-compliant version of the 1.6-litre direct-injection turbocharged 200hp engine featuring Stop&Start and optimised engine software calibration. Torque has been increased by 20Nm to 260Nm, matching that of the 220 Trophy. The peak level is now attained at 2,000rpm rather than 1,750rpm. Ideal car for some Trackskills at Kirkisown! Looks great but a car like this needs to be a manual ......nearly sure unavailable with manual. The RS badge and pedigree is all well and good, but I can't help but look at it as a £22K CLIO. | The RS badge and pedigree is all well and good, but I can't help but look at it as a £22K CLIO, that will probably break down a lot .